6' Ultra Slim Flexible HDMI Cable For 4k, HD, and 3D Video. Get the highest quality video experience with the most streamlined HDMI cable. Tight fits or bent corners are no problem for this bad boy. Built for durability, the 24k gold plated heads transmit strong, clear signals. This cable is fast. easily displaying content up to 1920x1080 resolution at 120 Hz. Not sure what those specs mean? It means this cable will take advantage of your TVs fancy technology for crisper touchdown passes, and more vivid explosions. The cable itself if 50% slimmer, and the head is 40% smaller, yet you get the best signal possible. A tight fit behind your flat screen TV is no problem. Whoever says size doesn't matter is a liar. 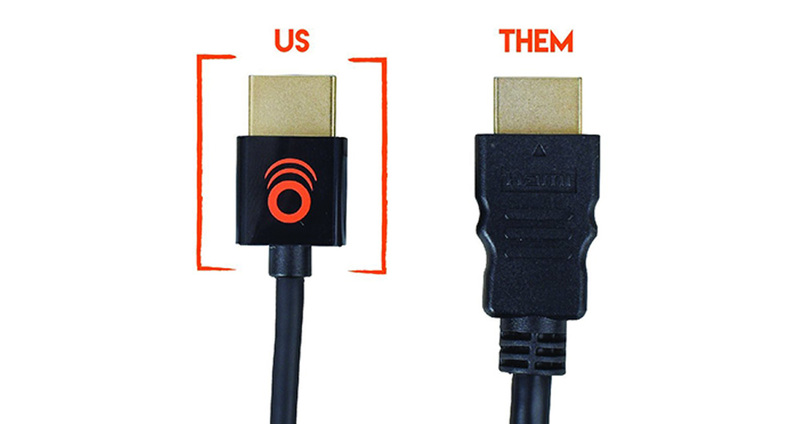 The smaller cable is more flexible, easily handling corners. All gold every thang...well at least the connector is gold plated. For the clearest signal, we're as good as gold. Forget about 1080P. This cable will carry the highest quality signals achievable by today's technology. Including 4K and HDR. “Fantastic SLIM-head if your HDMI connections are tight” -Sandra F.
Click the button below to add the 6ft Ultra Slim Flexible HDMI Cable to your wish list.